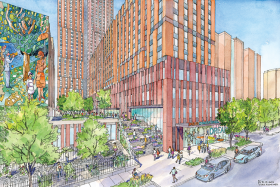 Permits have been filed for a 37-story, 384-unit tower in East Harlem as part of Sendero Verde, a massive mixed-use complex developed by Jonathan Rose Companies and L + M Development. 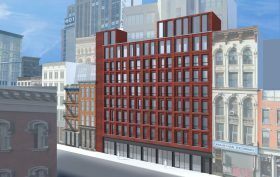 The site’s newest building is set to rise at 1681 Madison Avenue and measure just over 385,000 square feet. Floors five through 36 of the Handel Architects-designed building will contain 12 apartments each; offices and retail space will occupy the first three levels, as CityRealty learned. A fresh pair of renderings of Sendero Verde highlights the winding central landscaped path, nonprofit DREAM’s charter school and the extensive community space planned for the development. 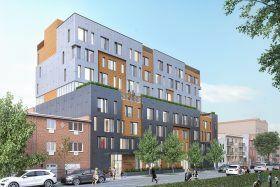 46 newly-constructed affordable units at the HANAC Corona Senior Residence at 54-17 101st Street in Corona, Queens are now available via the city’s affordable housing lottery. 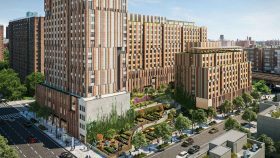 According to QNS, it will be the first affordable senior housing structure in the United States to meet the Passive House Institute design standards and the first affordable housing complex in Corona in three decades. Individuals or households that have at least one household member who is 62 years of age or older and who earn between $0 and $38,200 annually are eligible to apply. Five percent of units will be set aside for mobility-disabled applicants and two percent for vision- or hearing-disabled applicants. 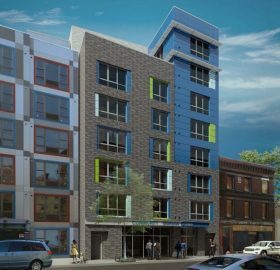 Applications are currently being accepted for 22 affordable apartments at 3365 Third Avenue in the Bronx neighborhood of Morrisania. 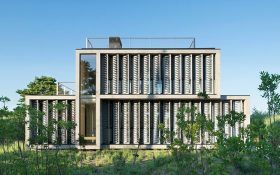 Developed by Bronx Pro Group and designed by Curtis+Ginsberg Architects, the project meets the passive house standard by featuring energy-efficient measures such as fiberglass triple-pane windows, LED lighting, and low-flow water fixtures — all of which will result in energy reduction savings as high as high as nearly 90 percent. Qualifying New Yorkers earning 60 or 100 percent of the area median income can apply for the units, ranging from $865/month studios to$1,969/month four-bedrooms. Despite Mayor de Blasio’s success meeting his affordable housing goals, East Harlem has fallen behind. 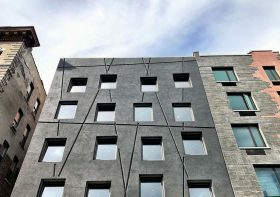 As 6sqft recently reported, out of the 21,963 new units added in 2016, just 249 were built in East Harlem, prompting the city to expedite the construction of 2,400 affordable units there over the next few years. 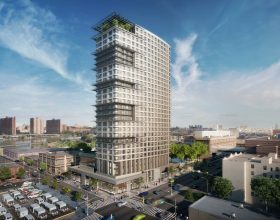 A large chunk of this will come from Sendero Verde, a massive, mixed-use development that will bring 655 affordable rentals to the block bound by East 111th and 112th Streets and Park and Madison Avenues. Back in February, Jonathan Rose Companies and L+M Development Partners released a rendering from Handel Architects of the 751,000-square-foot project, but now CityRealty has uncovered an entire batch of drawings from the firm that detail how it will be the country’s largest passive house project and weave together the residences, a school, supermarket, and four community gardens, all surrounding a multi-layered courtyard.